RM-Z450 - SUZUKI MOTOR - Magyar Suzuki Zrt. The RM-Z450 continues to deliver the class-leading performance that has made it one of the most successful 450cc motocross bikes ever produced. The 2016 model features a more advanced version of the Suzuki Holeshot Assist Control (S-HAC) system which gives riders the edge over the competition for the perfect start. Paired with the ultra-lightweight and easily tuneable 49mm Showa SFF-Air fork which brings factory level performance and adjustability to riders of all abilities. Add in the rugged, yet super responsive chassis to the mix and it’s clear that the RM-Z450 continues to be a winner. The most advanced fork in motocross, the SFF-Air fork is delivered straight from the factory race bikes. It consists of 3 air chambers that riders can easily adjust by using a hand-held air pump to quickly optimise the bike to the conditions, just like setting your tyre pressures. The three-chamber fork uses an Inner Air Chamber that handles the main suspension reaction force (spring-rate), a smaller Balance Air Chamber opposing the main reaction force, and an Outer Air Chamber that supports the main reaction force. Suzuki Holeshot Assist Control (S-HAC) is a selectable launch mode system derived straight from our factory race bikes. S-HAC helps riders takeoff from the starting gate for an early lead. S-HAC was first introduced last year on the 2015 RM-Z450, and now a refined version is available on the 2016 RM-Z250 & RM-Z450. There are three modes riders can choose for the best option per their skill level and starting conditions. For race-winning performance, a motocross engine needs to be durable, efficient and powerful. To win championships, that engine needs to come with the experience and know-how that you only get from Suzuki. The 449cm3, 4-stroke liquid-cooled, DOHC, 4-valve fuel-injected engine packs the perfect combination of broad torque and arm-stretching horsepower perfect for today’s racer. A motocross bike's single piston must endure an explosive environment and needs to perform with efficiency and durability. Through feedback from factory racing, the piston and piston pin were developed using Finite Element Method (FEM) analysis. The RM-Z450 piston pin has Diamond-Like Carbon (DLC) surface treatment, for less friction and increased durability. The RM-Z450 features a twin-spar aluminium frame and swingarm that has been developed and refined over the years to achieve the perfect balance between rigidity and flex. It's no secret that Suzuki RM-Zs are known as the best-cornering bikes in motocross. Fitted as standard equipment , the top-shelf Renthal aluminium Fatbar offers more strength and less vibration than standard size aluminium handlebars. Excel aluminum rims are made specifically to withstand rugged racing environments, including Supercross, outdoor Motocross and off-road conditions. The aluminium-alloy rims are designed and shaped to stay strong and to maintain their good looks. Lightweight, battery-less, motocross-use electronic fuel injection system with progressive throttle linkage makes for efficient power delivery. 12-hole fuel injector delivers a fine fuel/air mist for efficient operation. Aluminium cylinder with Suzuki Composite Electrochemical Material (SCEM) coating, built for durability, light weight and efficient heat transfer. 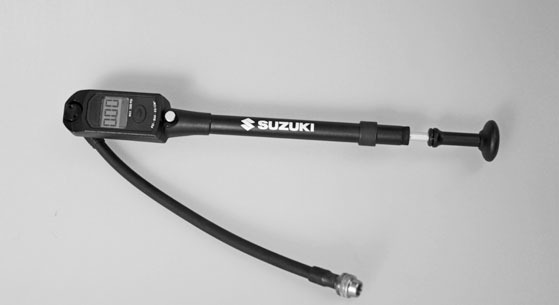 Showa piggyback-reservoir rear shock with high/low-speed compression damping adjustment, plus rebound damping and spring preload adjustments. The rear shock, working through Suzuki's superlative rising-rate linkage system, provides 310mm of wheel travel, delivering maximum traction. Race-inspired waved disc rotors and Excel aluminium rims are standard equipment. Gripper seat, with projected cross-shaped patterns on grey-coloured top surface provides the rider with additional grip. Maintenance cap for fuel pump and plug for fuel hose are enclosed for ease of maintenance when customer removes fuel tank for maintenance purposes. The muffler body uses conventional bolts, instead of rivets to simplify the replacement of muffler's glass wool packing.